Every year for the last ten years I’ve at least done something. Some years it’s been open the site, be too busy to dedicate myself to writing, and close the site. Some years I’ve started writing, either something new, or picked up something I’d started randomly in the year. I’d get various amounts of words in, miss a day, then two, then four then I’d see that I was so far behind the average per day needed to win, I’d give up. Ten Years. This year, my friend Tom and I both decided we’d do it again, both agreed to give it our all. I was especially motivated because a few months before Tom had shared a manuscript he wrote some 15 odd years before, and after reading it, I was more energized to create my own. I don’t know what was different this year, other than being a bit lighter than usual on “stuff to do” work wise. But I was able to start strong, and even when I fell behind a few times, it was never so much so that it became impossible. 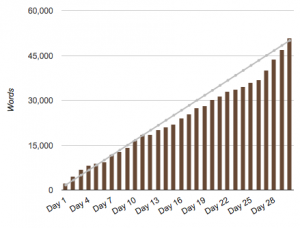 I actually thought I’d crush it over thanksgiving, but did the exact opposite, then when I was in the final week, the little author dashboard on the NaNoWriMo site was like at this pace you’ll finish on Dec. 2. “SO CLOSE” So I made time, and pushed through. I crossed the “finish” line around noonish on the last day. 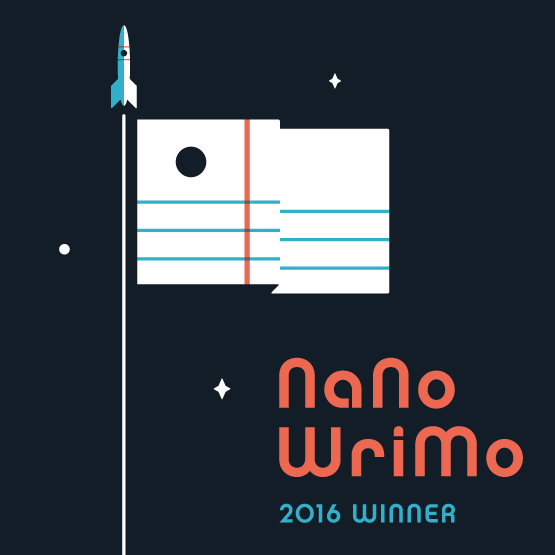 I think one factor of the win was that I finally found an app I enjoyed using to write. I’ve tried most every app out there aimed at authors, and haven’t loved any. Some of come close, some haven’t, some have simply gone away. Scrivener, is here to stay, the iPad app is great for when I wanted to try to add a few more words but didn’t have my laptop, the Mac app is fairly intuitive to use. Until the last week, I wasn’t sure I’d finish on time or finish at all. I have to say I’m pretty darned pleased with myself. My plan is to let it sit a week or two, then go back over the story with an eye for cleaning things up. Then anyone who’s interested may read it (warning it’s Sci Fi). Then Maybe I’ll toss it up on Amazon. Who knows. Any how, wanted to share, because like I said, I’m pretty pleased with myself.